I’ve been super busy the last week and a half or so and have kind of neglected the production diary a little bit. And the actual layout work for the book, although part of that was because it took me forever to learn the software and figure out how to set the pages up just right. But last night I drew the cover, so here it is! It’s pretty simple, but I like how it turned out. Especially considering that covers are not my strong point. At all. In the last production diary I talked about how originally I wanted it to be a big reveal early on that Doug is a demon and works in hell, and how I realized that wasn’t going to work because I gave the whole thing away in the premise. 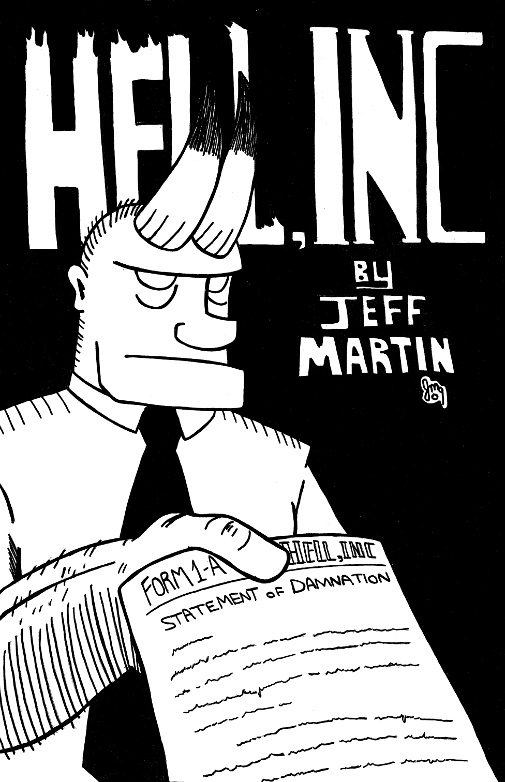 This cover kind of fits with that, since there’s really no way to hide the fact that Doug is a demon and works in hell when he’s on the cover and the title of the book is Hell, Inc. I guess it could be done, but then nobody would buy the book. This entry was posted on Wednesday, December 9th, 2009 at 2:55 pm and is filed under Blog. You can follow any responses to this entry through the RSS 2.0 feed. You can leave a response, or trackback from your own site.